This neckpiece pectoral is a stunning example of Andean featherwork, displaying the red feathers of a macaw and the blue and purple feathers of a Paradise Tanager or Spangled Cotinga. The former are sewn into place on the cotton plain-weave while the latter are glued along the frame and into figural forms. A human-like figure with a crested headdress is flanked by seabirds and fish. Along the base, the fringe is composed of finely worked beads of Spondylus shell, a feature common to late Chimú objects. The featherwork neckpiece is claimed to derive from a cache of offerings found on the southern coast of Peru. 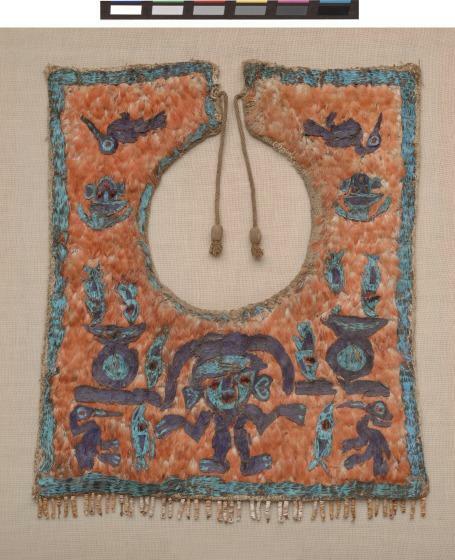 Despite their reputed recovery from southern Peru, this neckpiece and other cached objects reflect principally north coast Chimú designs. If the provenience is accurate, then this group demonstrates either the trade of Chimú elite objects or the presence of Chimú populations on the south coast during the Late Horizon (1400-1532 CE), perhaps under Inca imperial rule. Kimberly L. Jones, PhD, Inca: Conquests of the Andes / Los Incas y las conquistas de los Andes, Label text [1972.23.2.McD; 1972.23.1.McD; 1972.23.4.1.McD; 1972.23.4.2.McD; 1972.23.5.1.McD; 1972.23.5.2.McD], 2015. The foundation fabric for this bib was woven on a backstrap loom. After it was removed from the loom, the feathers were stitched onto the fabric by means of four rows of knots. The rows of feathers are sewn on so that none of the stitching is visible from the top side. 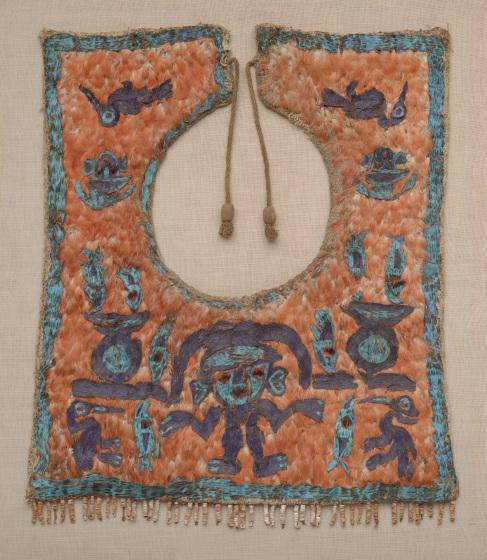 The cache of offerings found on the southern coast of Peru included a number of works in the DMA’s collections, a ceremonial rod (1972.23.2.McD), a featherwork neckpiece (1972.23.1.McD), a pair of coca spoons with bird and animal finials (1972.23.4.1.McD; 1972.23.4.2.McD), a pair of miniature camelid figurines (1972.23.5.1.McD; 1972.23.5.2.McD), and a set of small spoons with bird finial (1972.23.3.1.McD; 1972.23.3.2.McD). Read more about birds in the Andes.